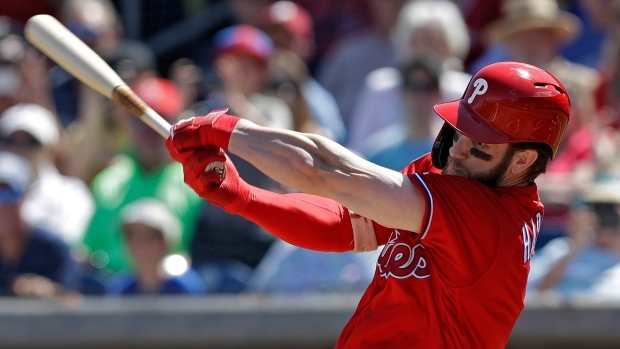 CLEARWATER, Fla. — Bryce Harper hopes to change all those zeros soon. Naw, not the ones in his contract. Harper returned as the designated hitter against the split-squad New York Yankees and went 0 for 3 with a walk. On Friday, Harper was hit in the right ankle by a 96 mph fastball from Toronto rookie Trent Thornton and left the game. He sat out Saturday. Harper, who agreed to a 13-year contract in late February — almost two weeks after spring training began — Harper struck out swinging on a 90 mph pitch from Dellin Betances in the sixth. Troy Tulowitzki, Greg Bird and Gleyber Torres homered for New York's split squad. Paxton allowed a run but no hits, pitching 4 1/3 innings, walking two and striking out four. Phillies starter Jerad Eickhoff pitched three shutout innings. Luke Voit hit his third spring homer and Miguel Andujar hit his first home run for the Yankees. Pitching prospect Jonathan Loaisiga started, allowing a hit and a walk in three scoreless innings. Joey Rickard had two singles for Baltimore, raising his average to .405. Alex Bregman doubled and singled, and is hitting .438 for Houston. Framber Valdez, in the mix for the fifth spot in the rotation, pitched four shutout innings. Astros manager AJ Hinch was absent — earlier in the day, he was suspended one game by Major League Baseball for his argument and subsequent comments about umpire Angel Hernandez after a game Friday. Freddie Freeman homered and drove in three runs for Atlanta. Julio Teheran started, pitching five innings and allowing one run while striking out six. Josh Harrison doubled and singled for Detroit. Starter Tyson Ross gave up two unearned runs in five innings. Rookie Touki Toussaint, currently slotted as Atlanta's fifth starter, pitched four innings and allowed three runs on five hits. J.D. Martinez had an RBI double for just his third hit this spring for Boston. Avisail Garcia and Joey Wendle drove in runs for Tampa Bay. Starling Marte hit a three-run homer and stole a base for Pittsburgh. Jameson Taillon allowed an unearned run in five innings, striking out six. Miami starter Trevor Richards pitched six perfect innings and Pedro Alvarez hit his third home run in his last three at-bats. Dexter Fowler and Paul Goldschmidt broke up the Marlins' no-hit bid with back-to-back singles leading off the ninth. Stephen Strasburg made his fourth start for Washington, pitching five innings and allowing three runs, six hits, two walks, striking out six. Juan Soto homered and doubled twice. Pete Alonso hit his fourth home run and Michael Conforto hit his third for New York. Robinson Cano doubled and singled, raising his average to .486. Randal Grichuk and Rowdy Tellez homered for Toronto. Aaron Sanchez started, pitching three innings and allowing four runs on six hits and a walk. Mitch Garver doubled twice and singled for Minnesota. Tyler Austin homered for a third time. Yasiel Puig hit a grand slam and a two-run homer for Cincinnati. Corey Kluber struggled in his second start for Cleveland, pitching 3 2/3 innings and allowing five runs on six hits and two walks. Madison Bumgarner pitched 6 2/3 innings in a start for San Francisco, giving up one run and striking out six. Billy Hamilton had two hits and stole his fourth base for Kansas City. Newcomer Daniel Murphy hit his first home run for Colorado. Chad Bettis allowed one run in 4 1/3 innings. Chicago starter Jose Quintana gave up two runs in four innings. Delino DeShields had two singles, scoring twice and stole his fourth base for Texas. Arizona reliever Archie Bradley retired just two batters, giving up two runs on three hits and a walk. Zack Greinke made his third start for an Arizona split squad, pitching 5 2/3 innings and giving up three runs on seven hits and two walks. Eduardo Escobar and Alex Avila homered. James McCann had two singles, scoring a run and raising his average to .438 for Chicago. Carlos Rodon got the start, pitching 5 1/3 innings and allowing four runs, five hits and two walks. Christian Yelich had two singles and raised his average to .500. Top prospect Keston Hiura had a three-run double in a four-run eighth. Zach Davies was roughed up in his fourth start, allowing six runs on seven hits and three walks. Chris Taylor homered and doubled for Los Angeles. Rich Hill started and surrendered three runs on eight hits, pitching 4 2/3 innings. Eric Hosmer hit a three-run double and singled for San Diego. Newcomer Manny Machado went 0 for 4 and is batting .148. Closer Kirby Yates pitched a scoreless inning, striking out two, and has yet to give up a run. Matt Harvey made his third start for Los Angeles, giving up two runs in 4 1/3 innings. He has a 7.27 ERA this spring.